Some 35 justice and peace activists arrived to a very warm welcome at St. David’s sixth form in Cardiff for an open meeting to consider how the vision of a ‘Good Society’ might be achieved. A number of the students and staff members ensured that all who attended were well looked after and we thank them for their hospitality. It was good to see that a number of students took part in the event and were present during the afternoon discussion. The day began with a short liturgy, placing all our deliberations and frustrations in the hands of the Father who cares for all of creation. The main speaker for the event was Alison Jackson from Church Action on Poverty whose presentation on a ‘Vision for the Common Good’ was stimulating and informative. Alison suggested that although politicians on all sides will tell us what is good for us – what will make us happy – this is not a state of being that any of the parties can possibly provide. The government of the day could and should be working to an agenda that provides the wherewithal for all citizens to feel part of society, able to make informed decisions for their own wellbeing. Poverty means exclusion, Alison stated that if you are poor then you can’t join in, be a part of everything that is going on. 18 “The Spirit of the Lord is upon me, because he has anointed me to preach good news to the poor. We must accept the challenges that this vision presents for each of us as we consider how we use our hard won voting rights effectively. Alison suggested that we challenge our potential political representatives by attending local hustings, asking relevant questions of each candidate, likewise to canvassers on the doorstep. During the course of the day there were many opportunities to network with justice and peace activists from around the country and get updates from national agencies as well as collecting interesting and informative campaign materials to distribute in our local areas. During the afternoon session we were given an update on the work of Cardiff Citizens, covering the wide range of issues currently being addressed. These included, listening to and then Identifying local needs, working with faith and non –faith groups, holding political leaders to account and offering training in local leadership skills and thus empowering the local community. Citizens were then more able to participate in the process of community development and engage more effectively with the statutory bodies. We heard something of the valuable support offered to refugees and asylum seekers in the Cardiff area and the complexities of the system in which the human dignity of the person is seemingly of less importance than the procedure and the regulation. We heard positive reports of the help being provided by many Church communities. 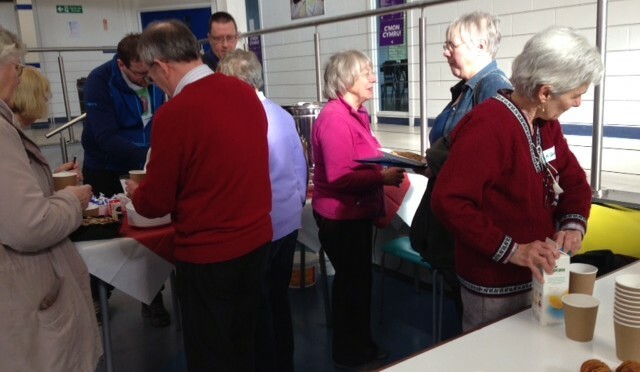 During the day there was plenty of time for networking, to read reports from dioceses, agencies and organisations, to sign petitions and campaign cards as well as sharing of contact details between local groups. The day ended with a heartfelt thanks to all who had planned and facilitated what was a most informative, encouraging and enjoyable occasion.